When it comes to green remodeling, high profile items like low e, multiple paned windows, photovoltaic solar panels, and ENERGY STAR rated appliances get all the press. But some of the greenest things you can do for your home are a lot less visible like greening your foundation, retaining walls, or taking on a basement waterproofing project. Whether you're looking for a more environmentally friendly form of foundation construction, or are more interested in green basement and foundation waterproofing solutions for a healthier home, here's a handful of suggestions from HomeAdvisor that should help you get off on the right foot. HomeAdvisor understands that it can be tough for homeowners to wade through all the "green" remodeling information out there, which is why we're happy to announce that we've teamed up with green remodeling expert David Johnston to provide you with the best, most accurate, green remodeling advice in the business. David Johnston is the founder of the green consulting firm What's Working, Inc., the author of multiple books on green remodeling (including the Nautilus Award winner Green Remodeling: Changing the World One Room at a Time), and he happens to know a thing or two about going green when it comes to building foundations, waterproofing below grade, and even how to add a green touch to things like retaining walls and backfill. Here's a green project guide from the man himself to help ensure your home is built green from the bottom up. Before we get to specific suggestions, let's take a moment to look at the cost of going green. After all, budget is a big concern on any remodeling project, and rumor has it that going green can add to your bottom line. The truth of the matter is that greening a foundation or waterproofing project is very cost-competitive compared to conventional means, and it can even save you money. And if going green does end up costing you a little bit more at the outset, don't forget that green foundations are generally stronger, better insulated (which means lower energy costs), and more waterproof, which can save you some major headaches, repairs, and ultimately a lot of money, as the years roll by. Despite all that, Johnston is also quick to stress that homeowners should be careful about getting too wrapped up in dollar figures when deciding whether to go green. Why? Because the true value of going green is far higher than any bottom line. Going green with foundations and waterproofing leads to healthier homes, higher quality builds, low maintenance foundations and basements, and most importantly, it means you're supporting a more sustainable way of doing things and contributing to a better world to pass on to future generations. When you put it that way, it's easy to see what Johnston is getting at when he says that the true value of going green is impossible to put a price tag on. 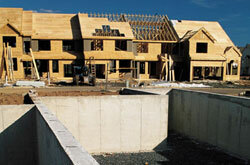 So, just what are your options when it comes to going green with foundations, retaining walls, and waterproofing? Here's a list of suggestions on going green, drawn from the wisdom, experience, and writings of Johnston himself, that will help you to increase energy efficiency, reduce your environmental impact, and create a healthier home. Use Concrete that Contains Recycled WasteThe bad news is that cement production is a major source of world carbon dioxide emissions. The good news is that as much as 50 percent of the Portland cement added to concrete can be replaced by recycled waste materials, including fly ash from coal fired power plants, rice hull ash, and ground blast furnace slag. Even better, these additives can increase the strength, water resistance, and durability of the concrete (though they will slow drying times). Insulate Your Foundation Using Rigid Insulated Concrete Forms or Rigid Foam InsulationInsulated concrete forms (ICFs) are innovative interlocking rigid foam blocks and panels that hold concrete in place during the curing process, and serve as an extra layer of insulation for your foundation once things have dried. If you don't use ICFs, consider adding a 2-inch layer of rigid closed cell foam insulation to the exterior of your foundation before you backfill. Use Environmentally Friendly Building ProductsMany products associated with foundation construction, such as petroleum based form-release agents and damp proofing materials, can release harmful VOCs into the air and lead to soil and groundwater contamination. Use environmentally friendly, biodegradable options instead. Reuse Form Boards or Use Metal FormsForm boards often consist of larger, solid lumber harvested from old growth trees that are discarded after a single use. Use reusable metal forms instead, or save old form boards for use on future projects. Use Recycled Concrete for Backfill and Retaining WallsThere is a lot of old concrete out there that can be broken into blocks and used to build retaining walls or crushed to provide backfill and facilitate good drainage. You'll save money over buying more expensive materials, and save some useful "waste" from ending up in the landfill. Install Non-vented Crawlspaces & Insulate Crawlspace AreasSince crawlspaces are uninhabited, outdoor ventilation isn't really necessary. Unventilated crawlspaces will stay cooler in the summer, and drier in the winter when moisture buildup can be a problem. Furthermore, consider insulating your crawlspace walls and applying a layer of polyethylene sheeting to the floor and walls to keep moisture levels down. While energy efficiency and environmental stewardship are both at the top of the green remodeling priority list, creating healthier homes is just as important. When it comes to creating healthier foundations and basements, addressing radon mitigation and waterproofing should be center stage. High radon levels are closely linked to lung cancer, while moisture issues can lead to a host of indoor air quality issues, including the development of toxic mold that is associated with everything from immune and nervous system disorders to cancer and respiratory issues. Here's what you can do to green your new foundation or basement in the health department. Test for High Radon LevelsRadon is a naturally occurring, odorless, invisible radioactive gas that leaches into your indoor environment from the surrounding soil, making it particularly dangerous for below grade living areas. How dangerous is it? It's been identified by the EPA as the second leading cause of lung cancer in the U.S., behind smoking cigarettes. Professional and self-administered tests are available to determine if radon levels in your home are at dangerous levels. Install Radon MitigationRadon mitigation is a must if radon levels in your home are high enough. There are many measures you can take, including installing sub-slab ventilation systems, airtight membranes over sub-floors in main living areas, and polyethylene air barriers over exposed dirt in crawlspaces. You can also seal cracks and joints in your foundation with caulking or foam, and install a gas trap in floor drains and sump pumps. If radon levels continue to be a problem, a fan powered radon mitigation system is the weapon of last resort. Extend Gutter Spouts Away From the HomeSounds almost too easy, but this is one of the most efficient ways to divert moisture away from your foundation, helping to eliminate the health and structural issues that excess moisture can cause. Add Gravel Filled Drains (Dutch Drains) at the Bottom of Drainage PipesIf you have moisture problems in your basement or crawlspace, consider installing gravel filled drainage pipes beneath ground level at the bottom of drainage pipes or in other areas where water collects close to your home. Install a Rooftop Water Catchment SystemRooftop catchment systems collect runoff in cisterns, wells, or drums. They help to reduce the moisture that reaches your foundation, while at the same time collecting runoff that can be reused for landscaping purposes. Properly Slope Landscaping Away from the HouseSometimes the most obvious solution is the most effective one. Making sure that landscaping slopes away from your home is the best way to prevent moisture from infiltrating your foundation or basement in the first place. Install Basement WaterproofingIf these simple drainage solutions don't solve your moisture issues, you should consider more extensive waterproofing measures, including sub-slab drainage systems, sump pumps, or a more comprehensive moisture mitigation system if necessary. While thinking green when it comes to foundations, retaining walls, and below grade waterproofing is a smart choice for your pocketbook, your home, your health, and the environment, it's not unusual for homeowners to feel a little overwhelmed when presented with the full scope of green remodeling options. If you're feeling unsure about how green you're willing to go with your upcoming project, there's no need to worry. Going green is not an all-or-nothing proposition, whether you decide to test for radon and extend your rain gutters, or go all out with recycled content concrete, full basement waterproofing, and a radon mitigation system. If you do think green is the right choice for your foundation or basement project, talk with your contractor about adopting a green remodeling philosophy, find a contractor who specializes in green building and remodeling, or seek out the services of a green consulting firm so that you can be sure that your upcoming project is as green as they come.